Amsterdam, The Netherlands, 20 April 2016 - A new study being presented today at the 4th Workplace and Indoor Aerosols conference in Barcelona shows, for the first time, that exhaled e-cigarette particles are liquid droplets that evaporate within seconds. The research - a collaboration between Kaunas University of Technology in Lithuania, EMPA Swiss Federal Laboratories for Materials Science and Technology, ETH Zurich the Swiss Federal Institute of Technology and Fontem Ventures - is the first detailed study of its kind conducted to investigate particles in exhaled e-cigarette vapour. Speaking from the conference today, Professor Dainius Martuzevicius, Vice Dean for Research at the Faculty of Chemical Technology, Kaunas University of Technology and leading expert on indoor air quality, said: "There is little data available on the properties of exhaled e-cigarette 'particles' in the scientific literature and as a result there is a growing discussion amongst the public health community as to whether the 'particles' exhaled following use of vaping products have potential implications for indoor air quality." During the study, regular vapers used commercially available closed system e-cigarettes while researchers measured particle concentrations in the surrounding air. Following immediate exhalation, scientist observed a rapid decay and evaporation of liquid vapour droplets, with levels returning to background levels within seconds. This was also observed under no room ventilation conditions, representing a worst case scenario. "This study shows that e-cigarettes - similar to other consumer aerosol-based products - release liquid primary particles into the air that disappear extremely quickly," said Dr. Grant O'Connell, Vice President of Corporate and Regulatory Affairs, Fontem Ventures. "But importantly, this also tells us how fundamentally different exhaled e-cigarette particles are compared to those emitted by smoking conventional cigarettes, the latter of which are reported to linger in the air for long periods of time. By contrast, no accumulation of particles was registered in the room following e-cigarette use." Marc Michelsen, Senior Vice President of Corporate Affairs and Communications, added: "This initial data supports the conclusions of Public Health England, the Chartered Institute for Environmental Health, Cancer Research UK and others that vaping indoors is unlikely to pose an air quality issue to bystanders and non-vapers." Fontem Ventures is continuing its research with additional studies to analyse the chemical make-up of exhaled vapour particles and the dynamic properties of other aerosol-based consumer products, the results of which will be presented at the Global Forum on Nicotine in Warsaw, Poland in June 2016. Fontem Ventures is the owner of blu, a leading e-cigarette brand in the United States and the United Kingdom. Headquartered in the Netherlands, and present on two continents, Fontem Ventures is an innovative consumer goods company, founded in 2012, committed to developing a portfolio of products that meet consumer needs, including the highest quality electronic vaping products. Use of electronic cigarettes (e-cigarettes) is rapidly increasing among smokers as an alternative to conventional tobacco cigarettes. As e-cigarettes do not contain tobacco and do not require combustion, the mechanism of aerosol generation within an e-cigarette and conventional tobacco cigarette is fundamentally different and so the mainstream aerosol which is inhaled by a user has different chemical and physical properties. There is little data available on the properties of exhaled e-cigarette "particles" in the scientific literature and as a result there is a growing discussion amongst the public health community as to whether the "particles" exhaled following use of such products has potential implications for indoor air quality. The presented study aimed to investigate the aerosol concentration variations within a room during use of a closed system e-cigarette. A room-simulating chamber was developed for this purpose to represent aerosol particle size distribution and concentration at a location of potential exposure of an occupant bystander in a highly time-resolved manner. The occupant bystander was represented by a seated heated "dummy" positioned close to a wall. The aerosol samples were drawn through a copper inlet tube in the mouth of the dummy and divided isokinetically to sampling instruments, which were positioned immediately outside of the chamber in order to minimize particle losses due to diffusion and evaporation. The ventilation air supplied to a chamber was conditioned in a heat exchanger and treated with three steps of filtration - pre-filter of class F7, activated carbon filter, and HEPA 13 final filter. A fast mobility particle sizer (FMPS; measuring aerosol particles from 5.6 to 560 nm [32 channels] with 1 second resolution) and electrical low pressure impactor (ELPI+; measuring aerosol particles from 0.017 µm to 10.0 µm [15 channels] registering readings every 1 second) was employed to monitor highly time-resolved particle concentrations and size distributions. The obtained data was fitted to regression model using partial least squares method to obtain relationship model between factors affecting particle concentrations in a room. Concentration decay rates were calculated as a measure of the removal of particles from indoor air. Very rapid fluctuations in aerosol concentration variations were observed during use of the e-cigarette. 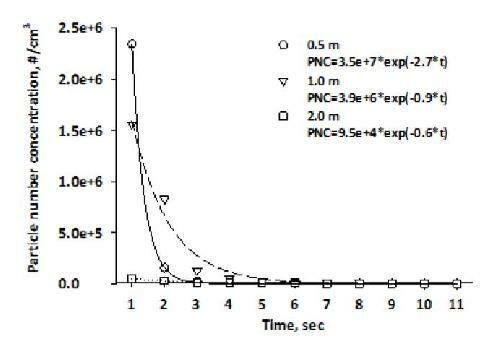 A rapid increase in the particle concentration during 2-5 second interval was followed by a rapid decrease in the concentration, reaching background concentration levels within 10 seconds (Fig. 1). A decay rate at 2.7 1/s was calculated if e-cigarette use occurred in close proximity to the bystander (0.5 m). Such a rapid decay rate may be associated with a direct influence of exhaled aerosol, which dispersed quickly, possibly due to effects of thermal fields from the heated dummy. A fast return to background concentrations also indicates that the majority of exhaled particles were in the liquid state and evaporated almost immediately upon exhalation. A greater distance between e-cigarette user and bystander resulted in both lower maximum particle concentrations coupled with a lower decay rate. This was associated with the fact that particles dispersed in the room more efficiently before they reached the dummy, but at the same time, no accumulation of particles was registered in the room during 30 min period after e-cigarette use. This study shows for the first time exhaled e-cigarette particles are liquid droplets that evaporate rapidly upon exhalation. The results presented here may have a positive implication for continued use of e-cigarettes in indoor areas.